This layered rainbow Christmas Tree Ornament is our second pattern in the 12 Days of Christmas Ornament collection! This is such a cute little crocheted gift to adorn your tree or use it instead of a bow on a package!! See video tutorial for visual instructions to sew everything together. Sew layers of circles through the center of each circle. Tie knots on the top and bottom to secure the layers. Sew star to the top of the tree. I had the wonderful pleasure of spending a few days with my sweet nephew. On Saturday afternoon, he and I set out to work on creating a character out of his imagination. My nephew chose the colors and the features as well as giving him a name. Meet Fredrick the Misfit Monster! 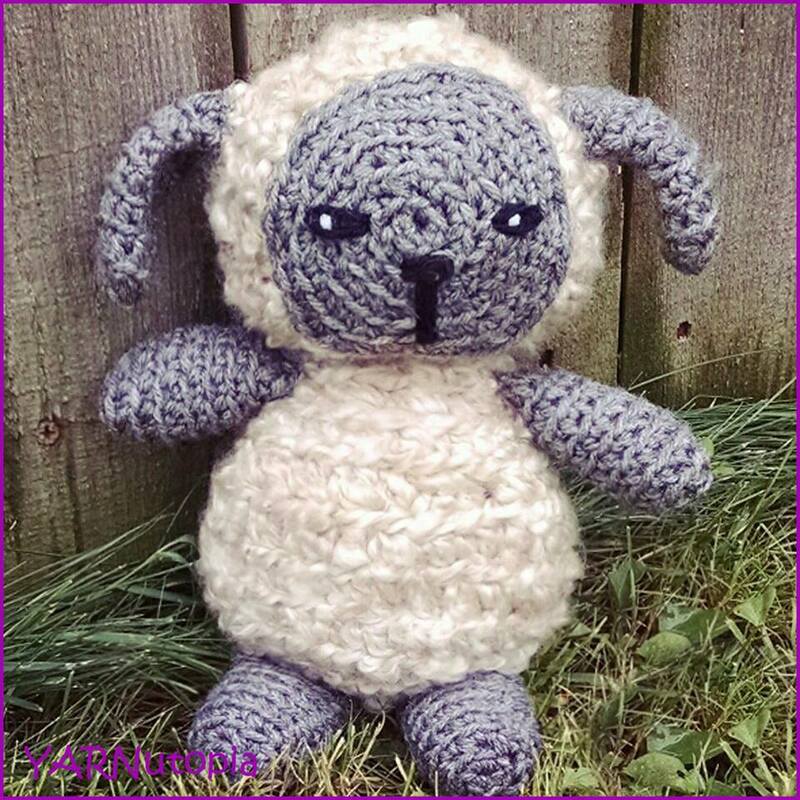 This darling amigurumi was born from the imagination of a very special 4 year old. Frederick is huggable and silly. He has lost most of his teeth but 3, from eating lots of candy that he sneaks at night. He loves adventures, finds mischief and mayhem, yet loves to cuddle. He protects and scares away creatures in the closet and under the bed or behind curtains! He likes to read books and play games on the iPad. Fredrick is a best friend. This is a great project to involve children. They can choose colors and features, as well as giving their very own misfit monster a name and personality! This simple project is sure to delight any child!! ***You can definitely sell anything you make from my patterns, please just link back to my website YARNutopia.com. Thank you! -I used Red Heart Super Saver Yarn but you can use any size 4 medium worsted weight yarn. -You can use a smaller F-3.75mm crochet hook or go up to an H-5.00mm crochet hook. I wouldn’t recommend anything bigger than an H-hook. -This toy measures 13.5 inches long and 20 inches wide. Shop Red Heart Yarns Website Today! Stuff this piece as you go, it will be difficult to stuff it completely when you finish. Do not sew body closed before adding the embellishments. Stuff arms and legs and attach them to the body, then add the mouth, teeth, eyes. Add stuffing to the body and sew up the top. Stuff and add the horns. See video tutorial to learn how to attach your pieces and fasten off. Weave in all the loose ends. I read an excerpt yesterday that said “Knowing that you will most likely out live them, owning a pet is to open yourself up to profound joy, yet prospectively profound sadness…” Although saying goodbye and letting go of our sweet girl, Bebe, was profoundly sad and difficult, the pure joy that she brought our family over the course of ten years can’t be measured in mere words. Saying that she was a good dog is a gross understatement. She was pretty much everything anyone would want in a pet. She was loving and loyal. She loved unconditionally. No matter what kind of day I was having, it could be made better by the love of a sweet dog who had no barriers. She just aimed to please. Many tears were shed on her shoulders and she would bear the burden of my pain. Many days of dealing with illness, she was company during lonely days and nights. She was a cuddle queen. More than anything, she was patient to a fault! She allowed me to dress her up, wore my homemade costumes and modeled them so sweetly. She made it easy to show everyone how cute she was when she got all dressed up and showed off our latest dog pattern. She was sweet that way. But she didn’t need a crocheted outfit to show off her cuteness. She was just naturally adorable! “She was smaller than a soda can when she first arrived in our life. A birthday gift from Fuad almost 10 years ago, he wanted another dog more than me. I got two for 1, brother and sister chihuahuas, Bebe and Rueben. She was the runt of the litter, born with a heart defect, short and plump, and a face that slightly resembled a fruit bat, but her sweetness makes her the most loving creature I know. Her loyalty knows no bounds. She lives every moment ‘in the now’. I can walk out my door, forget my keys, run back inside, and she is as happy to see me as if I was gone for a week. Tail wagging, excited dancing, happy, jumping, Bebe. I hope your tail is wagging as you make your way over that rainbow bridge, sweet girl. May you find endless fields to run and lots of friends to play. I’ll miss you.